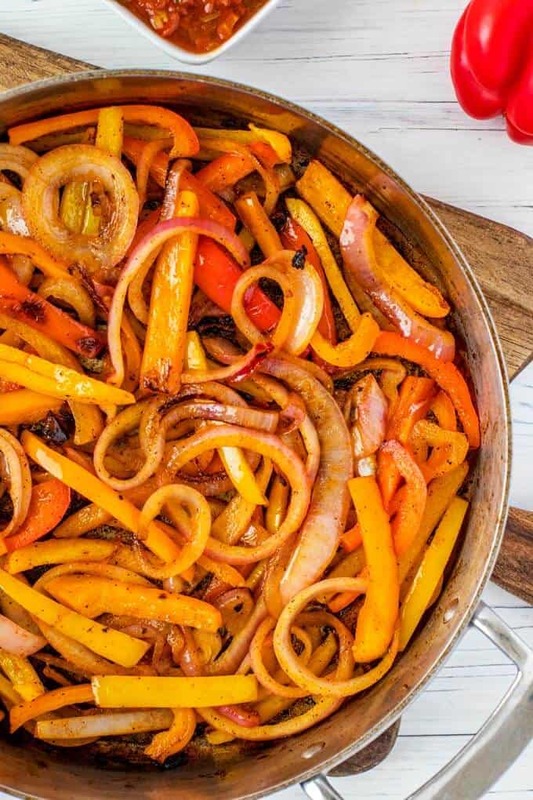 These easy Vegetarian Fajitas are made with onion, peppers, mushrooms, and zucchini seasoned in a zesty marinade. 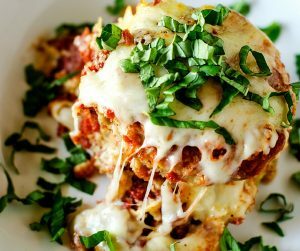 This flavor-packed meal has very little hands-on prep time making it perfect for a speedy weeknight meal. It just may become one of your favorite ways to use up your vegetables at the end of the week – feel free to get creative and use what you have on hand! 3.1 How Do You Make Vegan Fajitas? 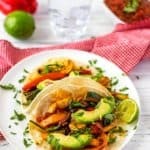 3.2 How Do You Make Low Carb Fajitas? 3.3 What Goes in Vegetarian Fajitas? I was in my teens when I had fajitas for the first time. There was something about sharing a smoking skillet with sizzling vegetables and meat that felt like an experience to me. 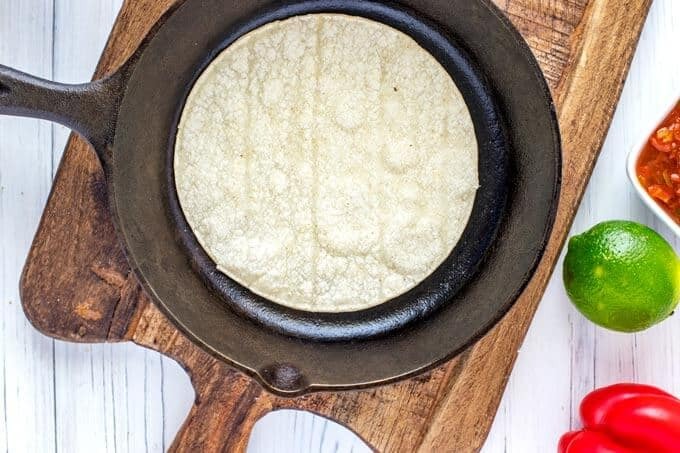 When we were younger (before kids and any worries about a hot skillet on the table came into play), my husband and I would frequently go out and share fajitas for dinner during the work week. It was a simple and not-so-expensive outing that I always looked forward to. Margaritas were a bonus, of course. Although, weeknight dinners out are quite infrequent for our family, but fajitas are still something we enjoy on a regular basis. I can’t decide what I love more – how simple they are to make or how delicious they are. 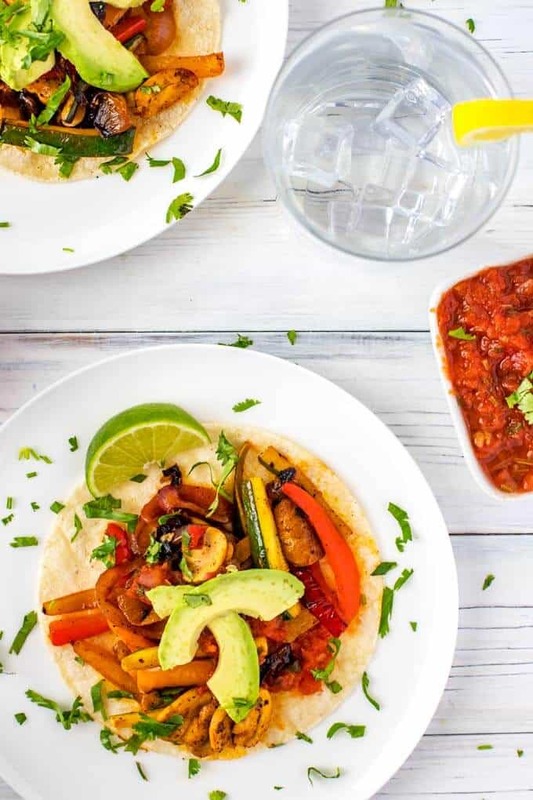 Although I may not be sure about that, I do know one thing – you are going to love these Vegetarian Fajitas! They are as easy to make as chopping some veggies, marinating them, and throwing them in a skillet. This recipe is perfect for Meatless Monday, or any time you are looking for a veg-packed meal. 3. Combine the marinade ingredients in a small bowl and whisk together. You can also combine everything in your blender. 4. 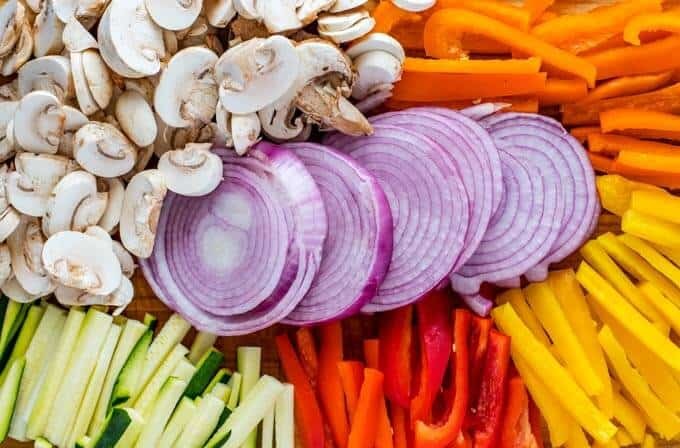 Place vegetables in a shallow dish. Pour the marinade over the veggies. 5. Allow to marinade for 30 minutes and up to 2 hours. 7. Heat avocado oil in a skillet over medium-high heat. 8. Add the onions and peppers to the pan and cook, stirring often, for 6 minutes. 9. After that, add mushrooms and zucchini and cook for 5 more minutes. 10. Meanwhile, heat another small skillet over medium-high heat. 11. Cook tortillas about 2 minutes per side in the small skillet. 12. To serve, add vegetables to warm tortillas. Top with avocado, salsa, sour cream, and cheese. How Do You Make Vegan Fajitas? How Do You Make Low Carb Fajitas? Skip the tortilla and use a lettuce wrap or serve the vegetables over a bed of lettuce. Alternatively, you can use a low-carb tortilla. What Goes in Vegetarian Fajitas? If you are short on time, buy pre-cut vegetables. Alternatively, the vegetables may be chopped up to two days in advance. Add one minced chipotle chili pepper and one tablespoon of adobo sauce to the marinade for a kick of heat. I used corn tortillas to keep it gluten-free, but you can use whatever tortillas you prefer. To add sweetness, add 2 teaspoons coconut sugar to the marinade. Skip the avocado or guacamole and instead serve with Mango Avocado Salsa. Serve leftovers in a pita or wrap. 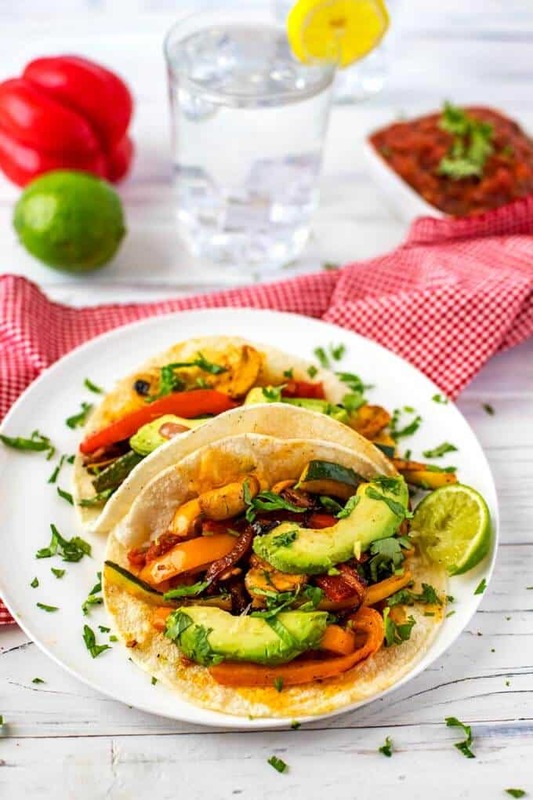 These easy Vegetarian Fajitas are made with onion, peppers, mushrooms and zucchini seasoned in a zesty marinade. This flavor-packed meal has very little hands on prep time making it perfect for a speedy weeknight meal. 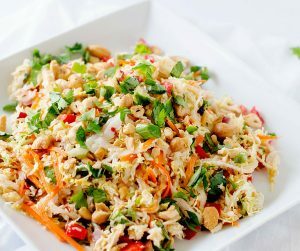 This recipe just may become one of your favorite ways to use up your vegetables at the end of the week - feel free to get creative and use what you have on hand! In a small bowl combine avocado oil, lime juice, chili powder, garlic powder, smoked paprika, cumin, salt and pepper. Whisk to combine. 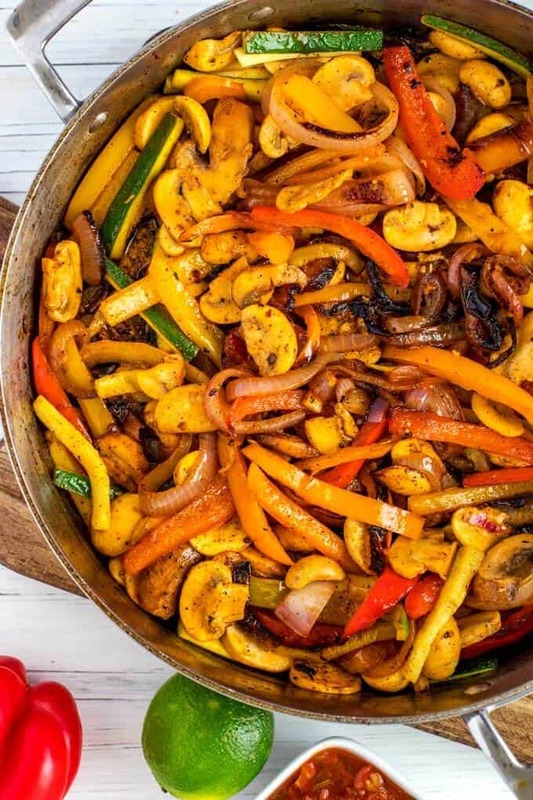 Place mushrooms, onions, peppers, zucchini and garlic in a shallow dish. 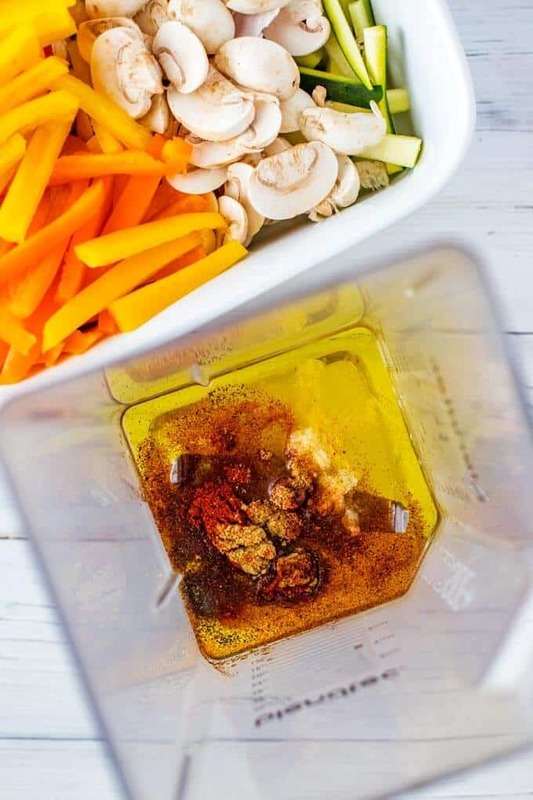 Pour marinade over the vegetables and let marinade for 30 minutes and up to 2 hours. Heat the oil in a skillet to medium-high heat. Drain the vegetables. Add the onion and peppers to the pan and cook, stirring often, for 6 minutes. Add mushrooms and zucchini and cook for 5 more minutes. Meanwhile, while the vegetables are cooking heat another skillet over medium-high heat. Heat tortillas in the skillet until warmed through, about 2 minutes per side. To serve, add vegetables to the tortillas and top with avocado, salsa, sour cream, and cheese.